Diese Seite ist keine Übersetzung meiner Ausarbeitungen, sondern eine Ergänzung meiner Homepage. Für die Übersetzung bitte ich gegebenenfalls meine Übersetzungshilfe zu nutzen. Für die Veröffentlichung des nachfolgenden englischen Textes habe ich für meine Jules-Verne-Seiten durch das CZECH CENTER NEW YORK, 1109 Madison Avenue, New York, NY 10028 – die Genehmigung erhalten. Ergänzende Hinweise von mir sind in blau/kursiv dargestellt. Andreas Fehrmann. Vielen Dank an Markéta Nováková und ihrem Team vom Czech Center in New York, die mir ihre Publikation zum Thema „The Fabulous World of Karel Zeman“ (Animated film series tours the U.S.) zur Veröffentlichung freigaben. 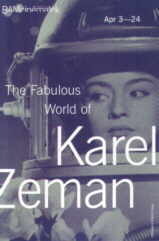 Filmmaker Karel Zeman (1910–1989) is considered one of the founders of Czech animated film. His long, inventive career stretched from 1943 until his death in 1989. His interest in animated film was born during his business school days, when he played puppet theater for children in his free time. Soon after, he decided to study at the Art School of Advertising in France, and after graduating he took a job with an advertising studio in Marseilles. His first experience with animated film was making an ad for soup. Zeman was an avid traveler, and on his way back to Czechoslovakia from France he visited Egypt, Yugoslavia, and Greece. Back home he continued to work in advertising, now for big Czech firms Bata and Tatra. While teaching at Bata’s window-dressing school, Zeman met filmmaker Elmar Klos, who was working for the film animation studio in Zlin. Soon after, Zeman brought his puppets to the studio, showed Klos a sample of his work, and was offered a job at the studio. But it was not an easy decision for Zeman. Not only was the salary only half of what he had been making in advertising, but his wife and two children lived in Brno, not a short drive from the studio in Zlin. In 1943, however, he decided to accept the job. Once there, he met animator Hermina Tyrlova, who had just finished animating the all-time children’s favorite Ferda Mravenec (Ferda the Ant). Together, Zeman and Tyrlova made the animated film Vanocni sen (Christmas Dream) and won the award for Best Animation at the 1946 festival in Cannes. Zeman was well on his way to becoming a world-renowned animator. The first project Zeman did on his own was a popular series of short films about a character named Mr. Prokouk. These humorous stories revolved around the problems of everyday life: Mr. Prokouk at the Office, Mr. Prokouk the Inventor, and so on. Zeman’s first longer film was Kral Lavra (King Lavra), which earned him a National Award in 1950. In 1952 Zeman made his first film combining live actors, animation, and special effects—Cesta do praveku (Journey to the Beginning of Time), a work that stunned the world. For further details please follow the LINK: REISE IN DIE URWELT . Four years later, he released his masterpiece Vynalez zkazy (The Fabulous World of Jules Verne ERFINDUNG DES VERDERBENS , a.k.a. An Invention for Destruction), opening a new world of possibilities that he explored in his other adaptations of Jules Verne novels—Ukradena vzducholod (Stolen Airship DAS GESTOHLENE LUFTSCHIFF ) and Na komete (Off on the Comet AUF DEM KOMETEN)—and classic stories such as Baron Prasil (Baron Munchhausen), Blaznova kronika (The Jester’s Tale), and many more. Zeman used sets painted in the style of Victorian illustrations, and then had live actors wandering through animated settings. The great success of these science fiction and fantasy features is a tribute to Zeman’s sense of humor and storytelling abilities, as well as his technique and originality. Though most of Zeman’s films are meant for children, they possess a sophisticated wit and visual style that enchants adults as well. His most unusual film remains the short Inspiration (1949). Here Zeman employed an astonishing technique, using series of glass figurines to produce remarkably smooth animation with an exquisite sense of timing, movement, and narrative structure. Another of Zeman’s feature-length animated films, Pohadky tisice a jedne noci (Fairy Tales of a Thousand and One Nights), consists of seven short stories about Sinbad the sailor. Later, in Krabat, Carodejuv ucen (Krabat -The Sorcerer’s Apprentice, 1975), and the Grimm Brothers’ fairy tale O Honzikovi a Marence (Hansel and Gretel, 1980), he returned to classical forms of animation. Zeman’s films have won numerous prizes, both at home and abroad. His films have played in more than 70 countries and he was a regular fixture at international film festivals, often as a jury member. His name is known throughout the world to animated-film lovers. The adventures of four boys who, after finding a trilobite, are mysteriously transported back in time. Sailing on the River of Time, they return to prehistoric days, encountering dinosaurs and other now-extinct creatures. The puppets Zeman used were based on the illustrations of Zdenek Burian. The film won the award for Best Children’s Film at the Venice Film Festival in 1955. This film is a world of wonders, containing a plethora of fantastic air, undersea, and earthbound inventions, plus a giant laboratory in a volcanic crater and an epic slugfest with a giant squid. The ingenious inventor of a powerful explosive is abducted by a Captain Nemo-like count who carries him off to a mysterious island, where he plans to put his invention to evil use. But the inventor’s faithful assistant comes to the rescue, foiling the villain’s plans to conquer the world. This film—the first to feature Zeman’s unique combination of actors, puppets, and cartoons based on the original steel-engraved illustrations of Verne’s novels—earned him an Expo Award at the 1958 Brussels Expo, as well as several prizes at festivals in France.